Martinair Flight 495 was a McDonnell Douglas DC-10 operated by Dutch airline Martinair, that crash-landed in severe weather conditions at Faro Airport, Portugal, on 21 December 1992. The aircraft carried 13 crew members and 327 passengers, mainly holidaymakers from the Netherlands. 54 passengers and 2 crew members died and 106 of the other occupants were badly injured. The ill-fated aircraft is seen here at Faro Airport in 1985. The aircraft involved was a McDonnell Douglas DC-10-30CF, registered PH-MBN, which was built in 1975 wearing the serial number 46924. It was named Anthony Ruys, after one of Martinair's former commissioners. It was delivered to Martinair on 26 November 1975. 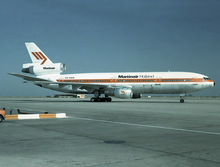 However, Martinair leased it out to three Asian airlines from October 1979 to September 1981. From then on until the accident, only disrupted by a short lease to World Airways in early 1992, it was solely operated by Martinair again, although it had been sold earlier that year to the Royal Netherlands Air Force for a planned conversion to KDC-10. On the morning of the accident, the plane was delayed at Amsterdam Airport Schiphol because of a faulty thrust-reverser. This was not fixed. Nevertheless, the plane took off to Faro at 7:30 am. According to Martinair, the faulty thrust-reverser was not a contributing factor in the accident. A large thunderstorm lay in the immediate vicinity of the airport, accompanied by heavy rain, windshear and low cloud. The control tower informed the crew of the thunderstorm activity, in addition stating that there was water on the runway. Following one unsuccessful attempt to land, the crew was executing a VOR/DME procedure approach to runway 11 (now runway 10) when the aircraft flew through at least two microbursts. According to the Portuguese final accident report, firefighters saw an explosion coming from the aircraft 22 seconds before it crashed. The aircraft landed with a vertical speed exceeding the manufacturer's design limits. Following this hard landing, the starboard main gear collapsed. The starboard wing fuel tank ruptured and the contents ignited. The DC-10 fuselage split in two, coming to rest with the front section lying on its side. There are different opinions about the causes of the air disaster. the combination of both factors caused forces that were greater than the aircraft could handle. the decrease of the lift coefficient due to heavy rainfall. then there was a high descent speed and extreme lateral displacement, which caused a hard landing on the right landing gear, which in combination with a considerable angular displacement exceeded the structural limitations of the aircraft. the dropping of the autopilot just before the landing, whereby the aircraft was flown by hand in a critical phase of the landing. On 14 February 2011, the Algemeen Dagblad reported among other things about a new investigation, which was carried out by researcher Harry Horlings at the request of relatives. According to Horlings, there was no wind shear at the Faro disaster (windshear) but the pilots had made serious mistakes. According to Horlings, the data from the black box was incomplete in the Dutch report from 1993; the last seconds were missing. In the cover letter to the report of the American Aviation Service, in which the data from the black box were presented, it was indicated that the autopilot had been used incorrectly. The report also recommended improving the training of pilots. The Dutch Safety Board stated that it was unable to respond because the Council had not been able to view and assess the report from researcher Horlings. Attorney Jan Willem Koeleman, who assisted some of the surviving relatives, announced that he would request Martinair to recognize liability and pay additional compensation. On 8 December 2012, Koeleman reported Martinair and the Dutch state to complain before the 21st of that month. After that date the case would be barred. The case against Martinair, which had meanwhile become part of KLM, finally served on 13 January 2014 in Amsterdam. On February 26, 2014, the court rendered judgment. She had ignored the new facts presented by the victims and ruled that additional damages were not necessary. The case against the State of the Netherlands served on 20 January 2014 in The Hague. On the same day on which the District Court ruled in Amsterdam, 26 February 2014, a decision was also made here by means of an interlocutory judgment. Unlike the court in Amsterdam, the court in The Hague deemed further investigation necessary and wished to hear experts. The air disaster at Faro happened a few months after the Bijlmer disaster. Although there were more fatalities at Faro, the disaster received relatively little attention in the media. Survivors felt that too little was being listened to and their observations during the flight. They united in the "Anthony Ruys Foundation", named after the name of the device. This foundation was dissolved in May 2011. On 16 January 2016, the EenVandaag program paid attention to the disaster. In the broadcast, a former technical controller from Martinair stated that at the time, under great pressure, he had signed a form in which the replacement of a landing gear of the aircraft was postponed for the third time. Such a postponement could only be granted twice. Attorney Jan Willem Koeleman, who assisted victims and survivors, discovered that an archive of the Aviation Council should remain secret until January 2073. CDA member of parliament Pieter Omtzigt calls this "very inappropriate" and announced to the government to ask for clarification. ^ a b "Rechtbank Den Haag: nieuw deskundigenonderzoek in de Faro-ramp". USA Advocaten (in Dutch). 26 February 2014.